Here are some simple but effective Home Remedies from Ayurveda for Common ailments. These remedies are safe and time tested and are in use for centuries in India. Learn how you can get relief from various ailments using your Ayurvedic Kitchen Pharmacy. Tips on Hair Care - Oil Massage for health and beauty – effective treatment for Dandruff. Simple and safe Ayurvedic home remedies to tackle with Acute and	Chronic Constipation. Ayurvedic Kitchen Pharmacy - How Herbal juices ,decoctions,teas can be prepared at home. 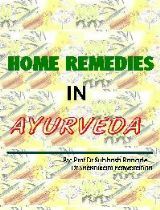 We are	offering 'Home Remedies in Ayurvedan' in eBook form!